CNC micromachining service for all hard materials to micron level tolerances is now available from Valley Design. By incorporating 5 Axis CNC micromachining capabilities to its extensive range of precision machining services, Valley offers a one-stop solution. From CNC machining to precision lapping, optical polishing, ultrasonic hole drilling, production dicing, backgrinding, wafering, edge polishing and beveling, Valley can do it all. Special capabilities include ultra-thinning, polishing to Angstrom level finishes, micron level tolerances, and tight flatness, parallelism and TTV specifications. 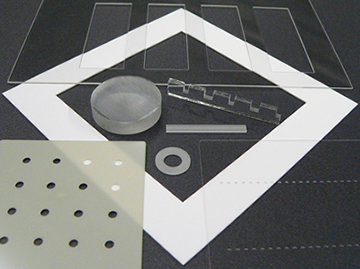 Materials for CNC micromachining include Fused Silica, Glass, Quartz, 96% - 99.9% Alumina ceramics, Aluminum Nitride, Metals and more. Valley can machine your provided material, or from our extensive inventory. CNC machined features may include pockets, through-holes, slots, channels, edge chamfers, corner chamfers, radii, steps, and complex shapes with tight tolerances. Alumina medical sensor light baffles - semicircular shapes with 1mm dimensions x a fraction of a millimeter thick. 304 stainless substrates, few millionths square by 0.5mm thick polished to less than 50 Angstroms surface finish.